The night before Christmas I was very sad, with none of the joy and anticipation I always felt during the Christmas season. Christmas in my village was time to prepare for the birth of Jesus. Relatives and friends visited and shared dinners of rice, chicken, goat, lamb, and fruits of all kinds. I was eight years old, but I had aged greatly. Earlier in the year, soldiers attacked us, taking young boys and girls away, and burning our whole village. Families were separated; some were murdered. We were forced to work and march for miles without food, losing all sense of time and place. One rainy night, we escaped from our captors. After weeks in the tropical forest, we made our way back to our burned-out village. We were sick, exhausted, and depressed. Most of our family members were gone. We had no idea what day it was. All at once, my grandmother noticed the flower we call “Fire on the Mountain” blooming in the marketplace. As far back as she remembered, the flower only bloomed at Christmas time. Somehow, it survived the fires. But how could it be Christmas without my parents? How could we celebrate after all we had suffered? As I thought sadly about these things, I heard the horns of several cars approaching our village. We thought the cars were full of men with machine guns, so we hid in the forest. To our surprise, they were ordinary travelers. It was almost dusk, and the travelers wanted to avoid land mines on the roads, so they stopped in our village. They were horrified at the devastation they saw. Many cried. They told us it really was Christmas Eve, and they were traveling to celebrate with family and friends. Now they would share Christmas with us. They shared the little food they had with us, and helped build a fire in the marketplace to keep us warm. My pregnant oldest sister suddenly became ill. We had no medical supplies, and were far from any hospital. People used their clothes to make a bed for her near the fire. That night, my sister gave birth to a beautiful boy. This called for a celebration, war or no war. 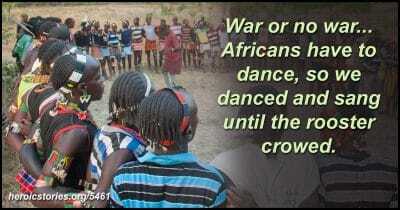 Africans have to dance, so we danced and sang until the rooster crowed. When morning came, my sister spoke for the first time since our village was attacked. “His name is Gye Nyame,” she said, which translates “except for God I fear none”. So Christmas did come that year — in the birth of my nephew. Despite our suffering, we saw hope in what this little child could do. I learned that Christmas comes in spite of circumstances; indeed the true spirit of Christmas is always within us. ?This/ is what Christmas is all about! Not the shopping, not the crowds in the retail stores, not the toys wrapped up in fancy paper and ribbon. It is the spirit of Jesus. I love this story, and would like to share it with my Facebook friends, but the button does not seem to want to respond for me. Which is what I ended up doing. Thank you — and thanks for restoring my faith in humanity. Once I have it composed to my own satisfaction, I also have a story to share. I would love to know what happened and how Addo came to North Carolina. I’ll bet that’s quite a tale, too. What a beautiful story. Yes, I would like to know that, too. He apparently became well-educated and is now a writer. But nothing will make him forget those early memories. Although I don’t observe Christmas–I’m not Christianity found this to be a very moving story. Thank you for sharing it.